What hymn encourages us to celebrate everyday miracles? Francis of Assisi (1181?-1226) looked at the world and saw something different than the rest of us generally see. In 1225, he composed his famous “Canticle of the Sun” which was paraphrased seven hundred years later by Anglican clergyman William H. Draper into verses for the hymn “ALL CREATURES OF OUR GOD AND KING.” In his poem, Francis gave thanks for Brother Sun, Sister Moon, Brother Wind, Sister Water, Brother Fire, and Mother Earth. He even wrote a verse for Sister Death. 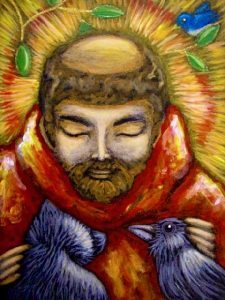 According to the well-worn stories, Francis, sometimes called the Patron Saint of Ecology, renounced wealth and warfare, danced with Lady Poverty, rescued earth-worms, preached to the birds, negotiated with wolves, founded the Franciscan order. The beautiful words known as “The Prayer of St. Francis” were mistakenly attributed to the man of Assisi. 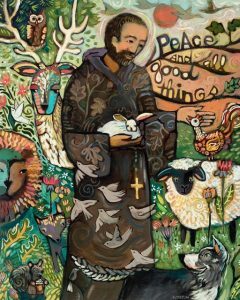 On or around October 4, the Feast Day of Saint Francis, many congregations in the U.S. celebrate the Blessing of the Animals. People bring their animal-companions or photos and stories to share with their church families and celebrate their personal connections to other species. In some churches, it is also a time to share information about choosing a nonviolent vegan or vegetarian lifestyle, honoring the lives even of the animals often consumed, worn, or used for labor and entertainment by humans. What happens when we dare to look at what is most familiar and see it in a new way? Children often have this gift. They look up at the clouds and see pirate ships, dragons, mashed potatoes! Francis saw the everyday miracles at his fingertips and found his place in the family of all creation. How would it change our national policies and global priorities if we really did think of the water as “sister,” the earth as “mother,” the wolf and the lamb as “brothers”? 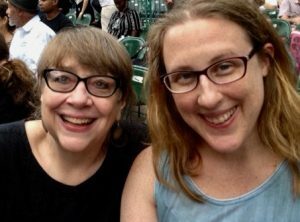 What if we really believed we were part of a great family of “all creatures” born to sing a chorus of “alleluia” to our creator? 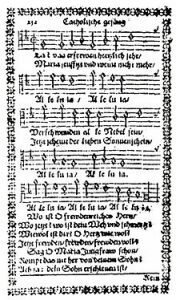 LASST UNS ERFREUEN (“Let Us Rejoice”) was originally published in the Jesuit hymnal, Ausserlesene Catlwlische Geistliche Kirchengesänge, in 1623 in Cologne, Germany. The tune is believed to have been composed by Friedrich Spee, a Jesuit priest and hymn writer who was most well known as an activist who opposed trials for witchcraft. Spee’s 1631 book, Cautio Criminalis, or a Book on Witch Trials, is one of the first written works to present strong arguments against the use of torture. The symmetry of this tune is part of the key to its popularity (the meter is 88.44.88 with refrain). The repeated four-syllable “al-le-lu-ia” phrase breaks up the longer eight-syllable pairings. Not only this, but the repeated pairs of alleluias are transposed exactly a fifth apart. 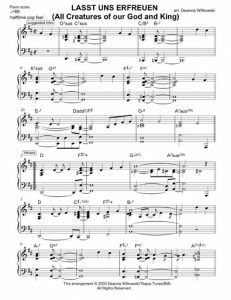 Click on this photo to view a sheet music sample of Deanna’s arrangement of LASST. This natural flow of the melody makes it a wonderful tune to arrange. In my treatment, I extend the ends of each phrase and add a bit of syncopation in addition to creating a more modern reharmonization of the tune. 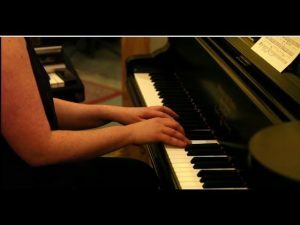 “LASST” was one of my first hymn arrangements, and it’s one of my most popular. It was originally included in Bill Carter’s Swing a New Song to the Lord: Resources for Jazz Worship. Now it’s in my sheet music book with all 13 of the arrangements on Makes the Heart to Sing. I hope that you’ll share the arrangement in your community (and write me at deannajazz@gmail.com to let me know!). 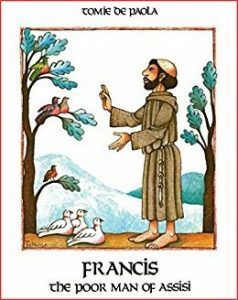 Francis, the Poor Man of Assisi by Tomie de Paola. Pam’s favorite illustrator created this book of biographical stories and myths about the beloved saint. 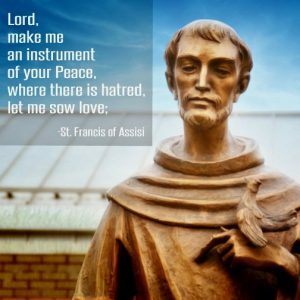 Praying Nature — From Ireland, a blog of resources and eco-prayers for people inspired by Saint Francis. Psalm 68 from the Genevan Psalter (check out the first phrase! ).